ASHEVILLE NC – The 17th Annual Asheville Metro Economy Outlook announced today it will feature Dr. Jim Johnson of the Kenan-Flagler Business School at UNC Chapel Hill, a nationally renowned expert on economic development and U.S. workforce trends. As the keynote speaker at noon on Monday, September 12, Johnson will present impactful demographic trends reshaping the U.S., state, and local economy. Johnson will highlight strategies for how local businesses and communities can better compete despite market ambiguity and shifting diversity in the workforce. “Employees and communities that understand how to respond effectively to the new normal of ‘certain uncertainty’ in the highly volatile global economy of the 21st century will be the most competitive and sustainable,” said Dr. Johnson. Fast Company named Johnson one of the “17 brightest thinkers and doers in the new world of work.” Johnson frequently appears on national network news programs and is widely quoted in national media on U.S. workforce trends. He will discuss solutions to the achievement gap affecting communities’ and businesses’ ability to compete in a hyper-competitive global economy. He’ll also provide a toolkit to help individuals weather an environment where uncertainty is the new certainty. Dr. Johnson is also the William R. Kenan, Jr. Distinguished Professor of strategy and entrepreneurship and director of the Urban Investment Strategies Center at the Frank Hawkins Kenan Institute of Private Enterprise. Before coming to UNC Chapel Hill, he spent 12 years on the faculty at the University of California, Los Angeles. He has a master’s degree from the University of Wisconsin at Madison and a Ph.D. from Michigan State University. The Economic Development Coalition (EDC) will share an update on AVL 5×5: Vision 2020, Asheville and Buncombe County’s five-year job creation plan to create 3,000 new direct jobs paying an average annual wage of $50,000, attract $650 million in new capital investment, and facilitate 50 new “high-growth” companies in Asheville that raise $10 million in equity investment. The program will be held at noon at the new Mission Health / A-B Tech Conference Center on A-B Tech’s campus. The Metro Economy Outlook is presented by Dixon Hughes Goodman LLP and Parsec Financial Wealth Management. The Metro Economy Outlook is open to the public and will be held at the new Mission Health / A-B Tech Conference Center at 340 Victoria Road in Asheville. Registration and networking starts at 11:30 a.m., followed by the program and lunch at noon, provided by Everyday Gourmet. Free parking is available in the adjacent parking deck. Tickets are $25 for Asheville Chamber members, $30 for the public, and $12 for students. Attendees must register in advance on the Chamber’s website: http://web.ashevillechamber.org/events. The event is hosted by the Asheville Area Chamber of Commerce and Economic Development Coalition for Asheville-Buncombe County (EDC). Sponsors of the 17th Annual Asheville Metro Economy Outlook include Dixon Hughes Goodman, Parsec Financial Wealth Management, Duke Energy Progress, ERC Broadband, Johnson Price Sprinkle PA, Carolina Alliance Bank; McGuire, Wood & Bissette, P.A. ; BMW of Asheville, HomeTrust Bank, UNC Asheville, WCQS Public Radio, and FASTSIGNS. The Economic Development Coalition (EDC) for Asheville-Buncombe County is a public-private partnership committed to: creating and retaining high quality jobs, community leadership, and being a resource for better business decisions. The EDC accomplishes this mission through its four core services: business retention and expansion, small business and entrepreneurship, research, and marketing and recruitment. The EDC is funded by Buncombe County, the City of Asheville, the Asheville Area Chamber of Commerce and over 80 private investors through AVL 5×5. Visit www.ashevillechamber.org/economic-development. Learn more about AVL 5×5 at www.asheville5x5.com. The Asheville Area Chamber of Commerce is a member organization with over 1,700 member businesses and organizations. Chamber members collaborate with community organizations and coalitions to support the community and each other with the mission of building community through business. The Chamber is home to a 4,000 square foot Visitor Center which welcomes over 208,000 visitors per year. To get active in the Chamber, visit www.ashevillechamber.org. ASHEVILLE NC – They came, they saw, they devoured. Over 1,500 eager foodies joined a panel of celebrity judges Sunday, Aug. 21 for the third annual WNC Battle of the Burger in Asheville. After the last taste was tested, a new ground chuck champion was crowned. Kitchen 743 at Isis Music Hall has taken home the coveted title of WNC Battle of the Burger winner. The win gives Isis a golden ticket to the nationally televised World Food Championships in Kissimmee, Fl. to complete for the title of World’s Best Burger. The Isis Burger stacked Hickory Nut Gap beef, heirloom tomatoes, baby romaine, shallot aioli, aged sharp cheddar and savory nueske bacon on a soft housemade roll. Isis went head-to-head against fierce competition, beating out former champions, and 2016 People’s Choice winner Rankin Vault. Isis Restaurant and Music Hall, located at 743 Haywood Rd., in Asheville, NC is a premier concert venue, bar, and eatery in the heart of West Asheville. In 2015, Isis Restaurant and Music Hall was honored with the Momentum Award Venue of the Year by the International Bluegrass Music Association. Their name gives a nod to the building’s history – a single screen cinema built in the mid 1930’s. The Isis Theater was a community hub for nearly two decades. Today, this art deco style venue hosts some of the best artists and musicians in the nation. With two stages, multiple bars and pet-friendly outdoor patio, this family-owned and operated venue is one of the hottest spots in the city for an eclectic array of live music and fine casual dining. ASHEVILLE NC – Farm To Village “Dining under the stars” September 8, 2016 @ 6:00 PM Boston Way. Restaurants and breweries in Historic Biltmore Village have come together to create a new and unique event. This event will serve as a fundraiser for Appalachian Sustainable Agriculture Project . Join us as we line Boston Way with farm tables and serve a 5-course gourmet dinner, from appetizers to desserts outside under the stars. Guests will have a chance to meet and mingle with our award winning chefs, brew masters, local farmers and a vineyard owner. ASAP works diligently to promote local farms and we will be serving fresh produce and meats supplied by those farms. The event is sponsored by Mtn. Merch, Saint Paul Mountain Vineyard, Southern Seasons, West Carolina Water Treatment, Wells Fargo, and The Village Group of Oppenheimer and Co. Inc. The meal will feature some amazing dishes provided by The Cantina., Catawba Brewing, Corner Kitchen, Doubletree Catering, Fig, Hi-Wire Brewing, Red Stag Grill, Rezaz and The Village Wayside. Tickets are limited to the first 100 people and are priced at $100 p/person. This includes food, wine and craft beer along with a gift bag for each person. About Historic Biltmore Village: Located directly across from the world famous Biltmore Estate, The Historic Biltmore Village is truly one of the south’s most unique touring and shopping environments. The Village features a collection of independent, regional and national retailers along with the most sought after restaurants and outstanding lodging. It’s the perfect night out for foodies, brews and friends. It’s a must see site for history buffs and architecture aficionados. In short, it’s a destination like no other. About Asap: Appalachian Sustainable Agriculture Project is a 501C (3) Non-profit organization whose mission is to help local farms thrive, link farmers to markets and supporters, and build healthy communities through connections to local food. ASHEVILLE NC – The Diana Wortham Theatre is pleased to announce an upcoming leadership transition. After 20 years as Managing Director, John Ellis will retire in June 2017 and Rae Geoffrey, the theatre’s current Associate Director, has been named the organization’s new Managing Director effective July 1, 2017. Under Ellis’s leadership the theatre has grown to be one the most active venues in all of Western North Carolina. He created the Mainstage Series of touring artists while also making the theatre a welcome home to many local arts groups. He has also developed a strong board of directors and a dedicated staff, making Diana Wortham Theatre a cornerstone of the cultural life in the area. Geoffrey has a long background in theatre, community outreach, and arts management. She was hired in 2001 as the Director of Outreach, creating a successful education series serving 10,000 students each year, establishing the Y.E.S. (Youth Education Scholarship) Fund, and building a solid volunteer core. She was promoted to Associate Director in 2008 and in that role oversees staff management, organizational planning, and artistic programming. She has worked closely with Ellis to lead the theatre through its “Vision for the Future” Project to create and implement an organizational vision and plan. Geoffrey’s leadership has been recognized by peers and colleagues who recently elected her as Board President of the North Carolina Presenters Consortium, a state-wide trade organization of presenting theatres across North Carolina and neighboring states, with more than 200 members including theatres, agents and managers. “John’s contribution to our organization has been invaluable and his leadership has made us what we are today and we cannot thank him enough. We are very fortunate to have another great leader within our organization who can lead us forward for the next 20 years. Rae’s experience here at Diana Wortham Theatre over the past 15 years has prepared her to take the helm when John retires, and I can speak for the board to say we are all excited to have such a highly qualified, competent, and passionate new leader in 2017,” notes Hardy Holland, Board President of the theatre. The Diana Wortham Theatre presents entertaining, enlightening, and enriching programs to residents of, and visitors to, Asheville and western North Carolina with live performances of music, theatre, dance and more by nationally touring artists (the Mainstage Series) as well as a wide array of performances and events by more than 35 professional and avocational regional arts groups. ASHEVILLE NC – ASAP is hosting the 2016 Southeast Farm to School Conference, the first regional farm to school conference serving the entire Southeast. The conference will be held on September 23-24, 2016 in Greenville, SC, serving teachers, early childhood educators, parents, community health professionals, and child nutrition staff from an eight state region. These stakeholders will come together to strengthen existing programs and jump start new farm to school efforts. The conference is a two day event: a full day of workshops and networking, a pre-conference day with field trips to sites in upstate South Carolina, and a local foods reception. With more than 15 years of experience in farm to school training and programming, ASAP’s Growing Minds Farm to School Program offers a combination of creative ideas and practical applications for school environments. The 2016 Southeast Farm to School Conference is designed to provide school staff and community members the training and resources necessary to implement successful farm to school programs. The conference will feature workshops focused on six specialized tracks (including an early childhood track) as well as networking opportunities and state meetings for individuals from North Carolina, South Carolina, Georgia, Tennessee, Kentucky, Florida, Mississippi, and Alabama. Each track will feature content for attendees new to farm to school as well as those that want to improve their existing programs. All attendees will receive certificates of completion for continuing education purposes. The Early Childhood track has been pre-approved as a training opportunity by North Carolina, South Carolina, and Georgia. In addition, the full conference is pre-approved by the Commission on Dietetic Registration as a continuing education opportunity for Registered Dieticians. The 2016 Southeast Farm to School Conference is made possible with support from the U.S. Department of Agriculture’s (USDA) Farm to School Program, Blue Cross and Blue Shield of North Carolina Foundation, and other community sponsors. Registration for the conference is now open at growing-minds.org. Attendance for the main conference day is $100 per person. Field trips and the reception are $35 each. More information on the conference and ASAP’s Growing Minds Farm to School Program is available at growing-minds.org or by contacting the ASAP office at (828) 236-1282. ASAP’s mission is to help Western North Carolina and Southern Appalachia’s farms thrive, link farmers to markets and supporters, and build healthy communities through connections to local food. Growing Minds, ASAP’s Farm to School program, has been in operation for more than a decade, connecting farms and schools and providing children positive experiences with healthy local foods. Experiences include farm field trips, nutrition education, school gardens, and local food in cafeterias. ASHEVILLE NC – Western Carolina University is the premiere outdoor adventure college in the region, according to a Blue Ridge Outdoors magazine online readers’ poll. The monthly magazine for outdoor sports, health and adventure travel in the Southeast and Mid-Atlantic announced the results in a recent article. It is the third straight year for WCU to gain the recognition. On campus and off, numerous outdoor opportunities await students, faculty and staff. From a multi-use trail system behind the Health and Human Sciences Building on its West Campus to the neighboring Blue Ridge Parkway, Great Smoky Mountains National Park and Pisgah and Nantahala national forests, as well as scenic lakes and waterways like the nearby Tuckaseigee River, there is quick and easy access to some of the best landscapes in the Southern Appalachians. The university’s Base Camp Cullowhee, the outdoor programming unit at WCU, offers dozens of outdoor recreation trips to students annually, provides experiential education services and has an equipment rental service. Among the academic programs offered by WCU that are of interest to students pursuing careers in the outdoors are parks and recreation management, forest resources, hospitality and tourism and natural resource conservation and management, along with geology and environmental science. The contest began with 32 schools in the running for the title. Following a “March Madness” theme, WCU progressed to the magazine’s online finals and faced Emory and Henry College of Emory, Virginia. Voting for the top spot began at 1 p.m. Monday, April 18, and concluded 9 a.m. Monday, April 25. ASHEVILLE NC – The Fine Art Museum at Western Carolina University is presenting an exhibition of images of the Great Smoky Mountains that in turn helped inspire the creation of the nation’s most visited national park. Through June 30, the museum will display “Vision and Vistas: Great Smoky Mountains,” with collected photos from the pre-park period by a veritable who’s-who of early 20th-century regional photographers, such as professionals like George Masa, Jim Thompson and George Grant, and accomplished amateurs like Herbert Pelton and Nace Brock. Pencil drawings by Civilian Conservation Corps enrollees Irving Fromer, J.D. Chaffin and Alan Youngblood also are on display. Great Smoky Mountains National Park was established in 1934 and formally dedicated by President Franklin D. Roosevelt in 1940. The 530,000-acre park is located in Western North Carolina and eastern Tennessee, receiving as many as 10 million visitors annually. This is the centennial year for the National Park Service. In 1916, President Woodrow Wilson signed the act creating a new federal bureau in the Department of the Interior to maintain parks and monuments. In celebration of that milestone, the National Park Service has launched an initiative to promote community connections to public lands, natural resources and cultural heritage. The museum is open 10 a.m. to 4 p.m. weekdays, with extended hours on Thursdays to 7 p.m. Admission and parking are free. To learn more, go to fineartmuseum.wcu.edu or call 828-227-3591. ASHEVILLE NC – Join the Asheville Symphony Youth Orchestra (ASYO) for an exciting spring concert, Sunday, May 22, 2016 at 3 p.m. at First Baptist Church of Asheville. The ASYO performance will feature works by Elgar, Brahms, Sibelius and guest artist Matt Townsend for the premiere of “For Now We Are Young” from the new album The Asheville Symphony Sessions. The concert will also include the epic debut of the 90-piece ASYO Prelude Orchestra with guest conductor, Emily Schaad. The concert is a free event, but donations are encouraged. The newly released album The Asheville Symphony Sessions is our gift to anyone making a minimum donation of $25 to the ASYO program. ASHEVILLE NC – They fix and sweep our streets, lay our sidewalks and plow our roads while the rest of us take a snow day. They collect our garbage, keep trees healthy and clean our public buildings of graffiti. They restore our streams, prepare the city when flooding is expected, and find ways to reduce the impacts of stormwater on our infrastructure. Employees in the City of Asheville Public Works Department are very, very busy, 24 hours a day, 365 days a year. This week is National Public Works Week, and the City joins the nation in taking a moment to recognize the often-unsung heroes of our society — professionals who serve the public good every day with quiet dedication. So quietly, in fact, that residents don’t always realize how much their communities depend on Public Works to build and maintain the infrastructure we use every day. “The men and women of the profession are always there and always ready,” Public Works Director Greg Shuler said of the 120-plus employees in the department. That became even more evident in the past month when, in anticipation of Public Works Week, staff visited schools to educate kids on the work they do. Business Manager Jakob Klodt and Sanitation Division employee Sonja Kun shared information about their work at Jones Elementary’s Career Day; meanwhile, Stormwater Division’s Justin Boll and Bobby Austin joined Street Division employee Mark Foster to bring a vacuum truck and a bucket truck to Haw Creek Elementary School. Above and beyond is just another day at the “office” for the City of Asheville’s committed Public Works team. City Council officially recognized National Public Works Week with a proclamation at its May 10 meeting. ASHEVILLE NC – George and Edith Vanderbilt encouraged their guests to explore the rolling hillsides, manicured gardens and verdant forests surrounding Biltmore House, especially in summertime. Thanks to careful preservation, guests today may experience the estate much as the Vanderbilts and their friends did 100 years ago. Summer at Biltmore runs May 27 through Sept. 5. 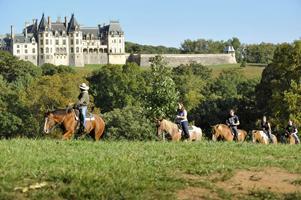 In addition to hikes and strolls, today’s guests may ride horses along trails with views of Biltmore House. More modern modes are available for exploration at Biltmore’s Outdoor Adventure Center, which serves as the jumping-off point for guests interested in Segway tours, bike rentals, stand-up paddle boarding, rafting and kayaking. Land Rover off-road driving experiences are available, as are fly-fishing and sporting clays instruction. No visit to the estate is complete without time spent in the gardens. Biltmore’s formal gardens flow from one to the next, offering guests varied scenery and places to stop and reflect. Garden and gardening lovers can lose themselves along meandering paths that lead down a gentle hillside to the Bass Pond. Along the way, guests can stop to say hello to the koi and goldfish that call the Italian Garden’s three pools home; marvel at the size of the elephant ears and tropical foliage plants that grow in the borders of the Walled Garden; and take in the heady scent of the historic rose garden. Antler Hill Village & Winery comes alive in the summer, especially on weekend evenings when Live After Five takes place. Live music on the Village Green features jazz and pop, the Grape Stomp and casual food including cookout favorites. Select nights this summer will bring stars to the South Terrace of Biltmore House with the Biltmore Concert Series presenting nationally- and internationally-known performers on the grand stage with views of America’s largest home. Summer also offers the last opportunity to see the Fashionable Romance: Wedding Gowns in Film exhibition, which ends July 4. Award-winning wedding dresses and costumes are showcased in Biltmore House, accented with elaborate floral displays. The exhibition continues in Antler Hill Village with a focus on the weddings of Biltmore founder George Vanderbilt and his descendants. The exhibition includes the first-ever display of the Lee family wedding veil worn by Mary Lee Ryan at her marriage to Vanderbilt’s grandson in 1957, which was also worn by her cousin Jacqueline Lee Bouvier at her 1953 marriage to future President John F. Kennedy. Another highlight is the re-creation of Cornelia Vanderbilt’s beautiful 1924 wedding gown and veil by renowned costume designers Cosprop Ltd., London. Choose from two distinctive properties to reap exclusive benefits like waking up on George Vanderbilt’s mountain estate. Experience the gracious hospitality with a luxurious package celebrating summer holidays at The Inn on Biltmore Estate, or relax with a more casual stay at the new Village Hotel on Biltmore Estate, located in the middle of Antler Hill Village’s activities. Kids free: Summertime means kids 16 and younger are admitted to the estate for the day for free (with ticketed adult). Runs May 27 through Labor Day, Sept. 5. Father’s Day: On Sunday, June 19, Dads are free with the purchase of an adult or youth ticket. Save on admission: Receive $10 off ticket price if visit is booked seven or more days in advance. Save $5 if booked one to six days in advance. Next-day upgrade is $10. More information is available at 866.336.1245, or by visiting www.biltmore.com. View suggested itineraries for more family travel ideas.